Bangor is adopting a new parking enforcement system. Instead of employing people to mark car tires, the city will now use a vehicle with a camera to take pictures of license plates. The city will soon patrol downtown street parking using a vehicle with mounted cameras that snap photos of license plates. The technology, new to Bangor, can take up to 400 pictures per hour from two small cameras mounted on top of a car, showing which vehicles haven’t moved from timed parking spots. The city approved $31,000 in funding for the license plate reader system in its annual budget vote in June. On Monday, city councilors unanimously approved amendments to a five-year contract with Republic Parking System, Inc., based in Chattanooga, Tennessee, which currently manages parking at Bangor International Airport and several downtown lots and garages. Republic Parking will purchase a hybrid vehicle for the new technology and lease it to the city for $4,700 per year, and the city will pay a $12,000 annual management fee for the service, City Manager Cathy Conlow said. The new system will start Oct. 1. By having a single vehicle and employee capable of doing what now requires four employees, the technology will improve efficiency and accuracy, Community and Economic Development Officer Tyler Collins said. “Currently, it’s not being done in the most efficient way to make sure those spots are turning over as they’re supposed to be,” he said. The new method is expected to result in more tickets being issued, but that’s more a byproduct of improved efficiency, Collins added. In 2017, there were 8,619 parking citations issued across the city, the bulk of which — 7,388 — were issued downtown, according to Bangor Police Department data. The city’s revenue from payment for those violations topped $139,670. 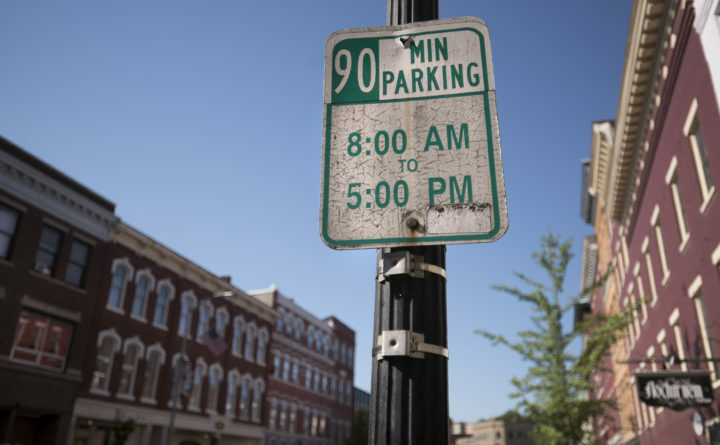 The new technology will hopefully encourage longer-term parkers to use parking garages and permitted lots, and minimize the downtown shuffle of moving from one spot to another, Community and Economic Development Director Tanya Emery said. Policing parking spots in the city’s downtown — from Harlow Street to the Penobscot River and from Oak and Union streets to Railroad Street — is mostly done on foot by two Bangor Police Department employees who drive to different downtown locations, park, walk and chalk each individual car. If the chalk is smudged when the employee returns again, it indicates the car has been moved. Under the new system, even if the driver of a parked car drives the car around the block and returns in the same spot, the license plate reader system can discern if the car has been moved by looking at the tire valve stem to see if it’s in a different position, said Parke Clemons, general manager of Republic Parking, Inc. Pictures of license plates without violations will be deleted within 72 hours, he said. Parking monitors carry handheld devices that allow them to print tickets on the spot — an aspect that, along with parking ticket costs, will not change with the new technology. One of the current parking monitors will retire before the new system rolls out, Bangor Lt. Bob Bishop said, and the other will likely be moved to another position within the city.